The School of Industrial and Labor Relations’ new New York City headquarters and conference center is in the historic General Electric building at 570 Lexington Ave. Credit: Jesse Winter for Cornell Brand Communications. 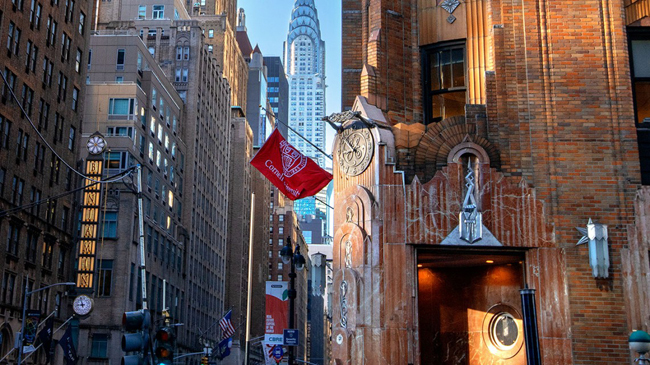 New York, NY, January 23, 2019 - Cornell is extending its reach in New York City while creating new opportunities for collaboration. On Jan. 2, the School of Industrial and Labor Relations’ new NYC headquarters and conference center opened in the historic General Electric building (formerly the RCA Victor building) at 570 Lexington Ave. in midtown Manhattan. Rebuilt with state-of-the-art technology, the new space will enhance ILR’s service to individuals, businesses, unions, government and other institutions, and expand its educational outreach to the thousands of people who take ILR classes in New York City or participate in its training sessions each year. In addition, nine other colleges, units or programs are moving their New York City operations into the ILR space, while Weill Cornell Medicine has had offices in the building since July 2018. The ILR School is leasing the 11th and 12th floors of the landmark skyscraper that overlooks the mosaic-tiled dome of St. Bartholomew’s Episcopal Church. Weill Cornell Medicine, including headquarters for the Weill Cornell Graduate School Master of Science in Health Sciences for Physician Assistants Program, occupies the building’s ninth and 10th floors. Weill Cornell Medicine’s administrative and external affairs offices are across the street. 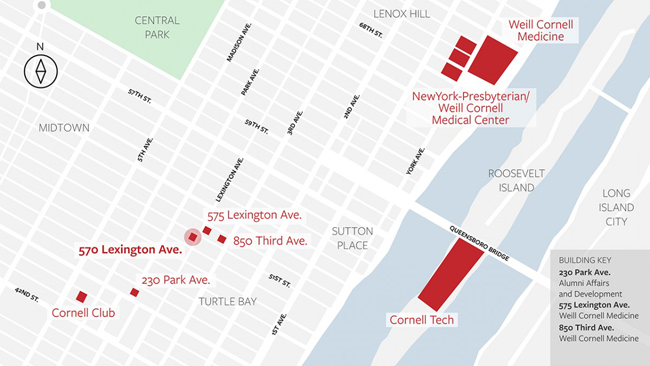 “The move from 16 E. 34th St. to 570 Lexington Ave., in close proximity to Weill Cornell Medicine and a short subway ride from the Cornell Tech campus, will build on the legacy of service that ILR has had in New York City since 1948, allowing the school to expand its programming and outreach efforts, and broaden its impact in the city, the region and the state,” said Alex Colvin, interim dean of ILR. The new 40,000-square-foot ILR space includes workstations and offices for nearly 100 people, with meeting rooms and phone booths equipped for remote conferencing. The upgraded ILR NYC Conference Center includes an e-learning broadcast and production studio, classrooms varying in size to accommodate 20-150 people, a café, large reception area and executive board room. Seven ILR institutes and programs will be housed there: the Worker Institute; ILR Executive Education; the Scheinman Institute on Conflict Resolution; the Labor and Employment Law Program; the Institute for Compensation Studies; the Smithers Institute for Alcohol-Related Workplace Studies; and the Institute for Workplace Studies. Ithaca-based ILR outreach programs, such as the K. Lisa Yang and Hock E. Tan Institute on Employment and Disability and the Center for Advanced HR Studies, will use the new location for meetings and forums, and ILR tenure-track faculty and visiting scholars have offices in the space. ILR will use the space to hold classes, workshops and seminars on such topics as labor relations, job creation and employment, the future of work, environmental stability, competing in a global economy, and diversity and inclusion. Engaged Cornell: Community-engaged learning and research programs and projects will be offered by Cornell schools, colleges and units with support from the Office of Engagement Initiatives, which also will provide New York City-area alumni with opportunities to participate in numerous community-engaged learning, research, leadership and other programs. Cornell University Cooperative Extension-NYC Programs: Twelve educators and administrative staffers provide programs on health, nutrition, and family and youth development; this location complements CUCE-NYC’s community-based program offices in the South Bronx and Jamaica, Queens. College of Human Ecology’s Practicing Medicine: Health Care Culture and Careers program: The program, formerly the Urban Semester Program, is aimed at students considering a career in health care. Cornell Engineering: The college’s Systems Engineering Program has space at 570 Lexington Ave. to extend and help systems research collaboration with other Cornell entities and with external entities in New York City. Cornell University Library: The space will support the information and research needs of Cornell’s New York City-based programs, students, faculty and researchers. School of Continuing Education and Summer Sessions: The school will offer summer classes in law and business management. New York Sea Grant: The program – a partnership between the National Oceanic and Atmospheric Administration, Cornell and the State University of New York – will leverage the new location to promote coastal community economic vitality, environmental sustainability and citizen awareness of the state’s marine and Great Lakes resources, including the program’s efforts related to Jamaica Bay, the Hudson River and education in the New York City metropolitan area. College of Agriculture and Life Sciences: CALS will provide a home base for visiting college staff and faculty through workspaces that will be reserved on a first-come, first-served basis. Cornell SC Johnson College of Business: The college plans to establish academic and office space in summer 2020. 570 Lexington Ave. is near a number of other Cornell offices and campuses in New York City. Credit: Clive Howard/Cornell Brand Communications.